Some people seem to find money so easy. Easy to make, easy to hold on to and easy to grow. The rest of us just find it easy to spend. The Rules of Wealth are the guiding principles that will help you generate more money, handle it more wisely, grow it more effectively and know how to use it to live a happier, more fulfilling, more comfortable life. 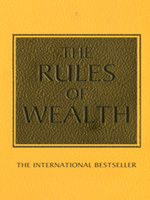 So, if you dream of having enough money never to worry about it ever again, you need the The Rules of Wealth. 46. Save in big chunks – or should you? 90. Put something aside for your old age – no, more than that! 107. What’s next? Pacts with the devil?